Dan Alexander Behar was the third young man to die senselessly in less than a week. And he was the third with a connection to Agoura High School, says Lisa Juaregui, whose daughter was a classmate. "They all knew him, you know," said Juaregui. "She said she spoke with him a couple of weeks ago." The suicidal car crash that killed the 17 year old sparked a small brush fire in Malibu Creek State Park. Last Wednesday, a 21-year-old Agoura graduate, Josh Feinberg, jumped to his death off Malibu's Rindge Dam. Three young people with ties to Agoura High School have all died in the past week. And Sunday, alcohol poisoning was blamed for the death of former Agoura football player Griffin Kramer. 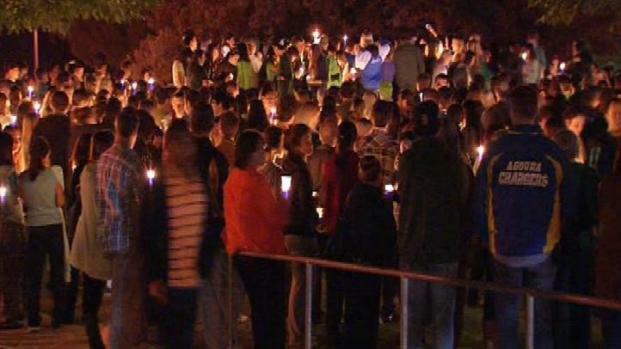 Tuesday night, a large crowd gathered at Agoura High School for a candlelight vigil. Sherry Gaba, an Agoura psychotherapist, has a theory about the deaths. She says her clients' issues have changed dramatically since the economy started to falter. Agoura Hills is a suburb full of professionals, many with college degrees and investments that have fallen hard. Families are being slammed hard by foreclosure, bankruptcy and business failures. "I think it’s changing with the economy," Gaba said. "Just like any other economy. I’m seeing it first hand." Gaba says we may never know if the pressures of becoming adults in a down economy played a role in the deaths. But if there is any evidence that it did, people need to know. "Everybody needs to know what’s going on," she says. "You've got to keep the communication alive, so there’s no secrets." Parents say children of a certain age can't be sheltered. "You really can’t insulate your child from that," said Adriana Tisherman.